The Eagles have scored 55 points this season in two games. 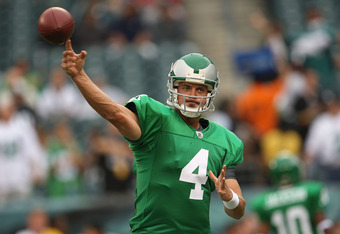 However, starting quarterback Kevin Kolb has only managed to only put three points on the board for the Eagles. Granted Kolb has only played two quarters of football, but his replacement Michael Vick has the NFL and Eagles fans electrified. Still, Kolb knows he must be better than his 5-for-10 performance for 24 yards if he expects to maintain the starting gig. He recognizes that he must make better decisions with the ball and get the ball out of his hands much quicker as well. Additionally, he knows his first game as “the starting quarterback,” did not go as planned, but will use it as a learning experience. As for the fans clamoring for Vick, he understands why they think that way. Although he believes in his ability and that he is the right guy for the job. For Kolb, he better be otherwise he will hear a lot of boo-birds from the Eagles faithful. "I was getting in a little workout, a little throwing." "It was different. It was, honestly, like an out of body experience. It's a lot more enjoyable when you're out on the field. The biggest thing is not being there battling with your guys, that's what you really want to do. And even the whole trip and just being at home, you'd much rather be out there." "Yeah, I mean because like I said, I passed all those tests on the sideline immediately after the hit and I felt good until I got back on the field and things started moving fast and all those pre-snap thoughts have to go through your head." "Well, I mean, I could have made it a little easier. I wasn't going through my reads very thoroughly and we just made a lot of mistakes across the board. And then, got in the rhythm of the game there and (QB) Michael Vick did a great job and came in and had a chance to go in there and tie it up." "Yeah, it's a different thing. I never really had to miss a game as a starter in a long time and it was hard to be out and I definitely didn't enjoy it, but you can see why. I mean, there were certain things that go on in your head with that concussion stuff that's just really awkward and it starts with passing that baseline test on the computer that you did when you were a rookie, and then it grows into doing some physical workouts and how you handle it. One of the tough steps for me and (Stewart) both was getting in the meeting room again. When you really try to focus in on something that's whenever it hits you. So, it's just a gradual thing all the way through, and then of course it ended with us going to get a CAT scan, and seeing the neurologist, and passed all that and good to go." "You know, really Wednesday was a turnaround day for me. I got a bunch of good rest there. I think sleeping is the biggest key and once I got a bunch of rest I started to see the improvement and then of course Friday, you know you feel your normal self." "Yeah, it wasn't exactly how I planned it out and played it through my head. But I'm a big believer in things happen for a reason and you just, the thing you learn about this sport is that you go through a lot of those highs and lows and everybody does; every single player, every single team at every single level. So, you have to find a way to fight through it and we fought through it yesterday and came out with a victory. And now we're 1-1 and trying to go get another win at Jacksonville." "No. It's different when you're in-house and in-house our main focus as a team was just, man, we have to go find a way to win. That was a must win for us and that was the focus of everybody's efforts." "I mean, I know I didn't play very well that first half. We didn't play very well and Mike's done a great job. I'm really proud of him the way he came in and led us in that second half and then led us to the victory. That was a good team win yesterday. All I can do is deal with what's on the field, and that's me getting out there. I'm anxious to get back on the field Wednesday for a practice and it starts there, and then going and getting a win against Jacksonville. I think if I just stay focused on those things and just play my game, then we'll be fine." "We we're just out of rhythm the whole time, basically there, that first half. I don't think it had anything to do with him coming in and out of the ballgame. I think it was more about us just executing and doing our parts as individuals and me doing the right things with the ball." "Yeah, I just think that everybody got a feel for the game in the second half and everybody started playing faster. And I don't think Mike's packages affected us at all in the first half." "Yeah, I mean I appreciate it, but I need to go prove it, too. That's the competitive nature of everybody. We know in this league that you have to go out there and give everything you have on every snap. And Andy's loyal to everybody and he's a trustworthy guy and he does what's right for the team, always. And I appreciate the words that Mike has said, and like I said, I'm proud of him and proud of the team, and I thought he did a heck of a job yesterday."